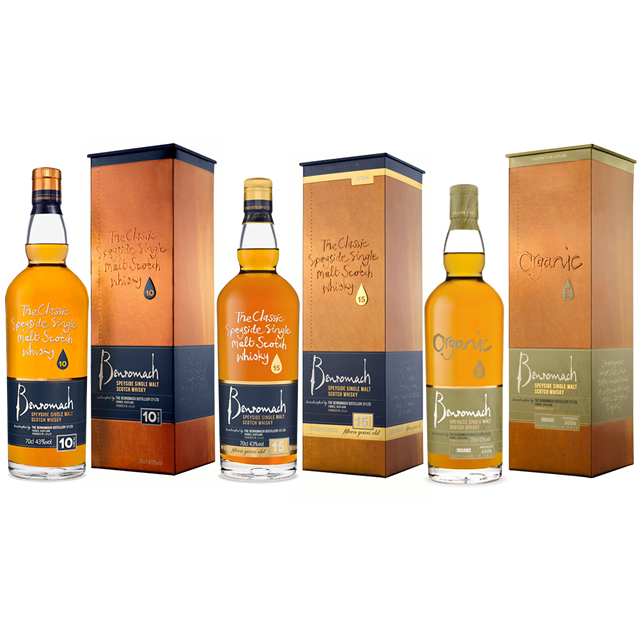 Pour yourself a dram of Benromach – not too wee and not too big. Swirl the golden liquid around your glass and notice the AROMA WITHOUT WATER. In other words, take a sniff. Indeed, indulging in several little inhalations is the best way to pick up all the different notes… rich sherry with fruit & nut chocolate, delicate spice, green apples, malty biscuit and a touch of light peat smoke. Now sip your dram, roll the whisky around your mouth and enjoy the TASTE WITHOUT WATER… juicy raspberries and brambles, sherry, creamy malt and a light peat. Next, take in the AROMA WITH WATER… it’s a wee bit nutty with a touch of charred oak and malt, and there’s also some fancy pineapple and kiwi. Add a drop or two of water to release the full TASTE WITH WATER. Savour the succulent mouth coating and taste the toasted malt, delicate peat smoke and lingering sweet sherry… our gorgeous classic Benromach Speyside style of single malt whisky. Pour yourself a dram of Benromach 15 Years Old. Lift it to the light and note the especially golden amber colour, thanks to the long maturation in sherry and bourbon casks. Now swill it around your glass and take a few little inhalations to savour the AROMA WITHOUT WATER… there’s a lot going on… beautifully balanced sherry aromas with vanilla pod, zesty orange and spicy ginger complemented by delicate chamomile and menthol notes. Now sip your dram, roll the whisky around your mouth and enjoy the TASTE WITHOUT WATER… there’s luscious, rich fruit cake with stewed plum, red apple skin and the sharp edge of kiwi fruit. Next, take in the AROMA WITH WATER… the whisky shifts into another gear with subtle hints of cocoa, nutmeg and cinnamon giving way to sweet honey notes and hints of bonfire embers. Add a drop or two of water to release the full TASTE WITH WATER… it’s a very satisfying palate with traces of charred oak complementing sweet tangerine, plum and nectarines… completed by a gorgeous touch of milk chocolate. Pour yourself a dram of this beautiful Speysider, lift it to the light and notice the golden brown colour, imparted by our virgin oak casks. Even the wood we use for maturing the spirit is an intrinsic part of producing this beautifully balanced Organic Single Malt Whisky… a world-first when it was launched. With that in mind, enjoy the sumptuous AROMA WITHOUT WATER. It’s delightfully sweet and malty at first, and after a few inhalations you may detect vanilla, toffee and banana influences coming through. Enjoy the TASTE WITHOUT WATER… roll it around your mouth and savour the creamy pepper and sweet fruit flavours, particularly ripe bananas. Add a trickle of water to release the whisky and take in the AROMA WITH WATER… fresh and malty with darker, delicious hints of coffee and cocoa. You may smell some vanilla notes, and a touch of the fruit bowl coming through once again – this time with citrus fruits, especially lemons. Now for the TASTE WITH WATER… the smooth and mellow body has an exotic carnival feel with some gorgeous chilli spice and tropical fruit flavours, balanced with creaminess and a dark chocolate edge: a mouth-watering balance with a smooth and long finish. Our whisky is certified Organic from start to finish, meeting rigorous UK Soil Association standards for growing the ingredients, distillation, maturation and bottling. Unique on launch in 2006, it is still very rare today.